Late last year Volkswagen unveiled the Tarok concept at the Sao Paolo Motor Show. Now it's brought it to New York to show to North Americans for the first time, laying the groundwork for a possible entry into the enormous US market for pickup trucks. 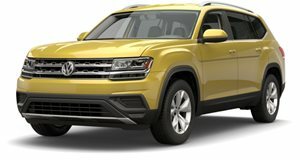 Though billed as a "compact pickup,” the Tarok is (alongside the Atlas) one of the biggest vehicles VW has built on its flexible MQB platform. But at 193.5 inches long, it's still a fair bit smaller than, say, the Ford Ranger (whose successor is expected to be co-developed with Volkswagen). The Tarok features a four-door cab with a relatively short bed, but incorporates an innovative adaptable load floor to make the most of its small footprint. The interior of the bed is just 42.9 inches wide (about a foot and a half narrower than the Ranger's) and just 47.5 inches deep (over a foot shallower than even the Ranger's shorter bed, and more than two feet short of the longer version). Drop the tailgate, though, and it expands by 27.4 inches. But the real innovation is in the aperture in the rear bulkhead, which opens up to extend the load area by another 25.8 inches. That gives you over 100 inches of contiguous load space, or nearly eight and a half feet. Even without the tailgate down, the combined length of the bed extended into the rear of the passenger cab extends half an inch longer than the long-bed Ranger's. And what's more is that its payload capacity is (surprisingly) much higher, quoted at 2,271 pounds (to the Ranger's 1,560-1,860 lbs). Also like the Ranger, the Tarok packs a turbocharged four-cylinder engine, but to power its compact form, the German automaker has left it a little lighter for the punch. Where the Ford's produces 270 horsepower from 2.3 liters, the Volkswagen's makes just 147 hp from 1.4 liters, transmitted to each of its 16-inch alloys through a six-speed automatic and 4Motion all-wheel drive with various drive modes. Off-roading specs are roughly comparable to the Ranger's, with an inferior approach angle, superior departure angle and ground clearance, and a breakover angle splitting the difference. But based as it is on a unibody crossover platform (instead of a body-on-frame ladder construction), the Tarok would ostensibly drive more like a car than a truck, similar to the Honda Ridgeline and Hyundai's Santa Cruz concept. The body-colored dashboard lends a flash of color to the usual utilitarian pickup cab. And features like LED lighting, digital instruments, a 9.2-inch infotainment display, and a removable Bluetooth speaker would set it apart in a market that's abandoned the compact segment in favor of larger mid-size trucks.